Well, as you’ve likely noticed by now, I’m back. Yayyyy!!! It was a perfect week. And I did NOT want to return to my unglamorous go-go-go, sleep-work-write daily grind. But alas, I had to. Thankfully, my transition back to reality hasn’t been too horrible. My job has resumed its nice, slow pace, and life in general has been calm. So my return has felt more like jumping into a lukewarm bathtub, not an icy pool–or a really deep puddle. As for my progress with my manuscript, lets see…I wrote three and half chapters last week during my time off, and I’ve almost completed another two this week. So things are moving along much faster and smoother than before my staycation. Woo-hoo! And if I maintain my steady pace, I should hit the halfway point by the end of July. Woo-hoo x 2! So, in honor of my return to reality and my not so glamorous daily grind, here is today’s Friday Funny. Enjoy! P.S. I’d like to wish my brother a very happy birthday today. He is one of my best friends and has always–ALWAYS–supported my dream of being a writer. So, happy birthday, Max! Hope you have a fantastical, most wonderful, best ever kind of day! The Flash Fiction Challenge 2014 Early Entry Deadline is Tomorrow! Coffee – To Drink or Not to Drink? Posted on July 18, 2014 July 18, 2014 by jenspendenPosted in Friday Funny, MusingsTagged fiction, Flash fiction, Flash Fiction Challenge, funny, humor, literature, Manuscript, novel, NYC Midnight Flash Fiction Challenge 2014, staycation, story, tips, write, Writer, writer's life, writers, writing. Welcome back:)! The homework and writing quote is brilliant! And so true. But no wonder I always loved homework as a child. 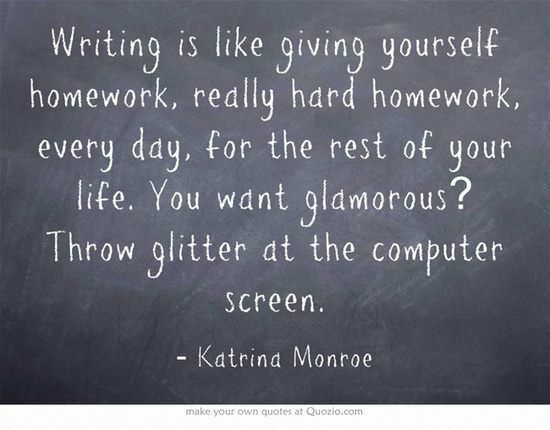 “if you want glamour, throw glitter at the computer screen” LOL. So true. Right? I love it…I should go buy a bottle of glitter and just put it next to my computer with a sign “When in need of glamor, throw at screen”.